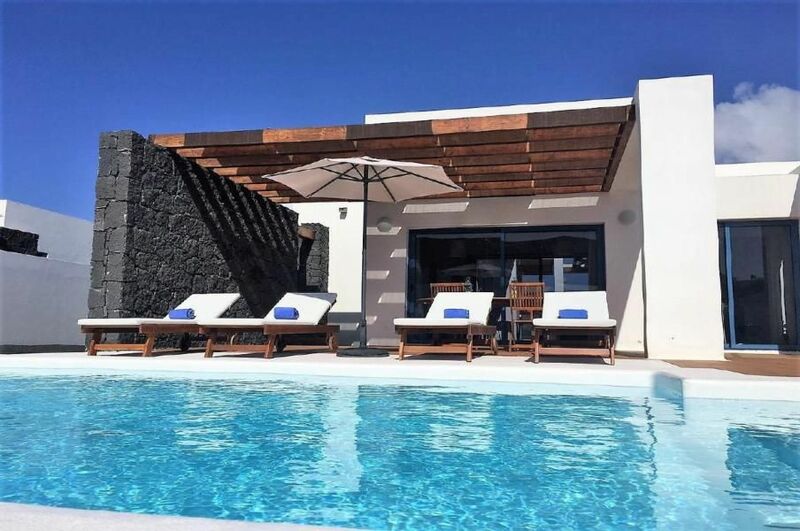 The Villas Bellavista are set in the fascinating volcanic landscape of Lanzarote in the immediate vicinity of Playa Blanca. Ideal for a sunshine holiday with ones partner or family. Each of the Villas Bellavista has its own heated pool for a refreshing dip all year round. The spacious terrace is ideal for prolonged sun-baths or entertaining barbecue evenings in the mild climate of Lanzarote. The living-dining area is tastefully furnished with a strong contemporary design dominating. Provided for your home entertainment is a Sat-TV, DVD-player and a W-LAN Internet-connection. Each villa offers a bedroom with double bed and a second bedroom with two single beds. A well equipped kitchen makes holiday catering a pleasure and offers all utilities. An unforgettable holiday in a well tended residential complex here in the sunniest spot on Lanzarote is guaranteed.